There are two different types of basic cells. Cells that have no membrane around their nuclear material are Prokaryotic. Bacteria and cells that form pond scum are Eukaryotic. 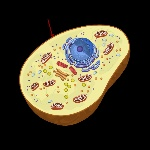 A Eukaryotic cell has a nucleus with a membrane around it. The animal and plant are all Eukaryotic. Each cell in your body is constantly active and has a specific job to do. The activities in your cells might be compared to a business that operates 24 hours a day making dozens of different products. A business operates in a building. A cell is similar. It functions within a structure called the cell membrane. Materials that are needed to make specific products are brought into the building. Finished products are often moved out. Similarly, nutrients are absorbed into the cell and waste products are released. Plant cells are eukaryotic cells that differ in several key aspects from the cells of other eukaryotic organisms. A cell wall composed of cellulose and hemicelluloses, pectin and in many cases lignin, is secreted by the protoplast on the outside of the cell membrane. Micro organisms made up of a single cell that has no distinct nucleus. Bacteria reproduce by fission or by forming spores. Plant, Animal, and Bacteria cells. 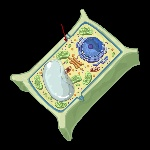 The major difference between an animal cell and a plant cell is that plant cells have cell walls. The cell wall is a rigid structure outside the cell membrane that supports and protects the plant cell. It is made of bundles of tough cellulose fibers and other materials made by the cell. Plant cells also differ from animal cells because they can make their own food. Chloroplasts are organelles in plant cells in which light energy is changed into chemical energy in the form of a sugar. One of the chemicals in chloroplasts that traps light energy is chlorophyll, a green pigment. an organelle found in large numbers in most cells, in which the biochemical processes of respiration and energy production occur. It has a double membrane, the inner layer being folded inward to form layers (cristae). The nuclear envelope, also known as the nuclear membrane, is the lipid bilayer membrane which surrounds the genetic material and nucleolus in eukaryotic cells. The nuclear envelope consists of two lipid bilayers—the inner nuclear membrane, and the outer nuclear membrane. a space or vesicle within the cytoplasm of a cell, enclosed by a membrane and typically containing fluid. Meiosis: A type of cellular reproduction in which the number of chromosomes are reduced by half through the separation of homologous chromosomes in a diploid cell. Function of Mitosis:Cellular Reproduction & general growth and repair of the body.